I grew up watching Alton Brown in Good Eats and then Chopped. He was the one who made cooking something that was not only accessible, but also interesting and unique. Watching those shows, I learned that there doesn’t have to be mystery around what is going to taste good and be healthy…there’s a science behind it all. And it’s not quite like baking, where everything is much more defined and rigid. With cooking, there’s still a lot of room to grow and experiment! THE SCIENCE: Athletes have increased energy needs, which allows for more opportunities to obtain the nutrients they need through a balanced diet composed of a variety of natural foods. Most sports nutrition professionals agree that supplementation will not necessarily improve performance. My biggest takeaways from watching Alton Brown were more about technique than any specific recipe. Most importantly, I realized that simple and healthy food doesn’t have to be boring with the right seasoning and technique. For example, you can take a food that some people might consider bland, like roasted pork or maybe a plain egg, and if it’s treated right, it’ll taste great. 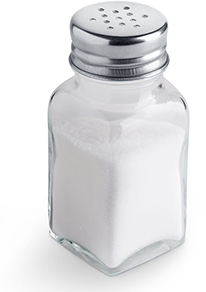 It’s even easier as an athlete since you’re usually not worried about having too much salt because you’re constantly having to replenish your sodium levels to recover from workouts. THE SCIENCE: Many times, athletes wait to drink until they are thirsty. Thirst is not an accurate indicator of how much fluid an athlete has lost. As a matter of fact, most individuals do not become thirsty until more than two percent of body weight is lost. Waiting until you are thirsty can affect your performance and when athletes only drink enough to quench their thirst, they may still be dehydrated. For best results, keep a bottle of fluid available when working out and drink as often as desired, ideally every 15-20 minutes. The ingestion of sodium through sports drinks during exercise may also help with maintenance or restoration of plasma volume during exercise and recovery. As an athlete, cooking was a fun hobby that was also complementary to my career. And now as a retired athlete, cooking has provided another outlet where I can always look to improve. The best part is you can get immediate feedback on your work – did it taste good or not? After accumulating numerous accolades as a member of USA Swimming, including gold medals at the 2011 National Championships, the 2011 FINA World Championships, and the 2012 U.S. Olympic Trials, Andrew Gemmell went on to compete at the 2012 Olympic Games in London, where he placed ninth in the 1,500m freestyle. Andrew has since earned a degree in economics from the University of Georgia.